S.A. Richards Prop It 5" X 18" X 15" made of buffered Acid- Free fiberboard Includes 24 sheets of 20" X 30" Unbuffered acid- free tissue to protect and prevent creasing in folds of stored items Safely store all your textile memories with the use of this box! 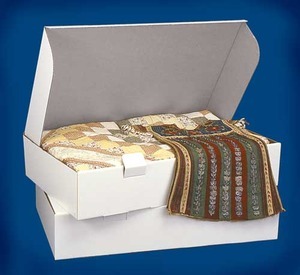 This unique one-piece box made of white, buffered, acid-free corrugated fiberboard is the economical way to store and protect quilts, wedding gowns, heirlooms, costumes and other valuable textile items. Box includes 24 of 20-inch x 30-inch sheets of unbuffered, acid-free tissue. 5" x 18" x 15"
This is a SAR Acid Free Storage box that measures 5x18x15" and it comes with twenty-four 20x30" sheets of unbuffered acid-free tissue that will help protect your quilt & textiles. The box will be shipped flat and has instructions how to set it up. Also there are important do's and don'ts tips along with a suggested folding procedure for quilts.